A rare possum has gone viral on social media, thanks to her uncanny resemblance to a popular Pokemon character. 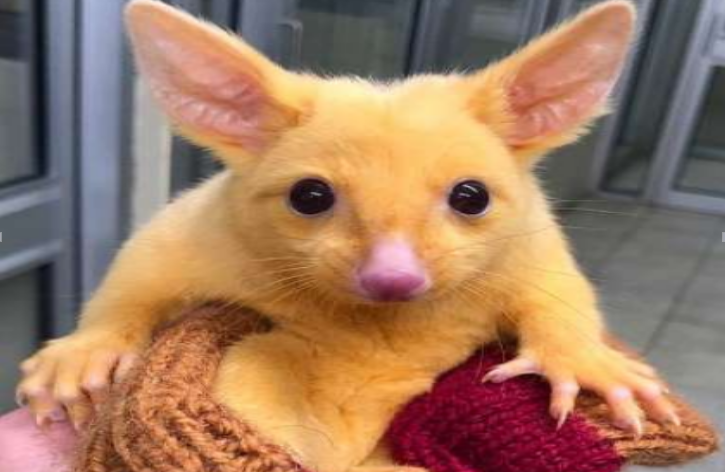 The baby possum was recently brought into a Melbourne vet clinic and has since been nicknamed Pikachu for her similarity to the famous animated rodent-like creature. "We recently had a very special possum brought in to the clinic," Boronia Veterinary Clinic and Animal Hospital posted on its Facebook page. "The golden color occurs due to a mutation which causes a low level of the pigment melanin." They are so rare in the wild. Although their bright color makes them look special to us, they also stand out to predators! Luckily for this baby possum, she's gone to carers to be raised and then will end up in a wildlife sanctuary. The photo of the adorable animal has attracted more than 1,300 shares and sparked hundreds of comments on Facebook. 1. Where is the baby possum now? 2. Why does the baby possum have golden fur? A Because the baby possum is dying. B Because people paint it golden. C Because baby possums always have golden fur. D Because a mutation causes a low level of the pigment melanin. 3. What’s the Chinese meaning of the underlined word “sanctuary”? 4. Which of the following statements about the baby possum is NOT true? A The baby possum is like Pikachu. B The baby possum is easily found in the wild. C The photo of the possum has attracted more than 1,300 shares. D The photo of the possum has sparked hundreds of comments on Facebook.